An incredible ocean front getaway starts with two things, Surf and Sand. Coincidentally that also happens to be the name of the luxurious Laguna Beach resort that was recently named one of the Top 20 Resorts in Southern California by Condé Nast. Surf and Sand Resort has an intimate feel although it can accommodate several guests with its 167 beachfront guest rooms, and by beach front, I mean literally the sand and ocean are right at your balcony. The crashing waves lull you to sleep in one of the most comfortable beds of any hotel stay. It's definitely a place to relax and unwind from the busyness of that LA life. 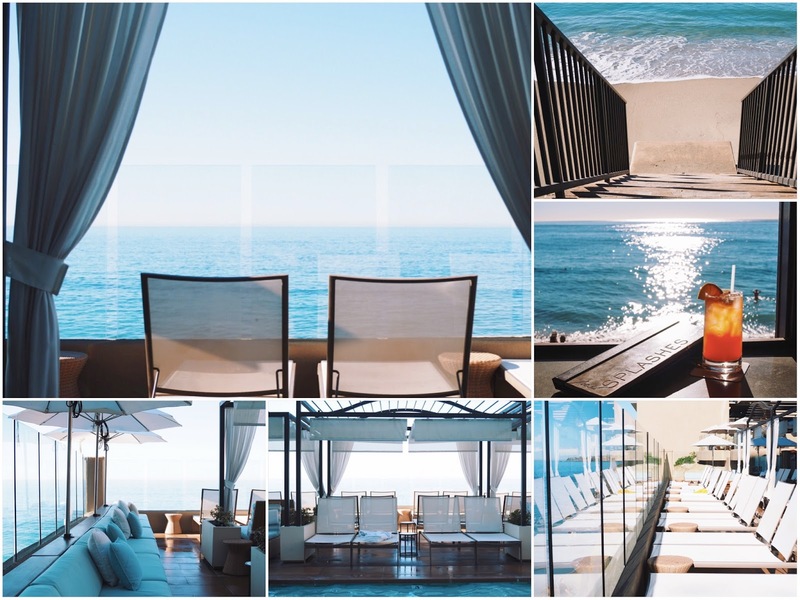 The resort itself is a renovated ocean front hotel that sits along 500 feet of beautiful aqua blue Laguna Beach shoreline. Surf and Sand also boasts one of the best spas and has the highly regarded Splashes Restaurant onsite that overlooks the ocean. You can't beat the views, and the food is absolutely delicious. Dinner at Splashes looks like this, you start with fresh cocktails as the sun set over the Pacific ocean. For a starter, the lobster bisque sounds good, but make sure to order the perfectly cooked, grilled octopus. The main dishes to get are the Whole Branzino and the 6-Hour Short Rib served over carrot puree. Both dishes are amazing! The short rib is tender and perfectly balanced with the sweetness of the carrot puree. It's a very comforting dish and perfect during a winter beachside getaway. Also, service is always outstanding. Splashes has to be one of the best hotel restaurant experiences yet. The views, the food, the location, and attentive service are reasons to just visit and dine there, even if you're not planning on staying overnight. But how could you not stay? The entire property is the perfect backdrop for an oceanside getaway. Laguna Beach is perfect this time of year because the weather crisp and the streets are adorned with Holiday decorations. It's a great "town" to hang out in and the free open-air Trolly that runs up and down the street every 20 minutes from Dana Point to Laguna will replace that Uber driver you were planning to call. But then again, why would you even want to leave Surf and Sand? 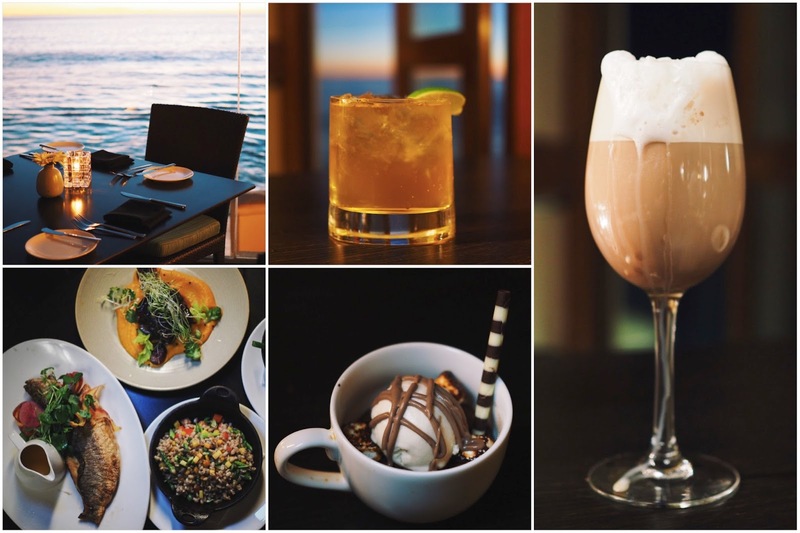 Clockwise from bottom left: Whole Branzino and Short Rib dishes; outdoor table at Splashes; bourbon mule, Splashes Cappuccino with grand marnier, Bailey's, Kahlua, espresso and steamed milk; chocolate molten cake with marshmallow ice-cream and Kailua sauce. 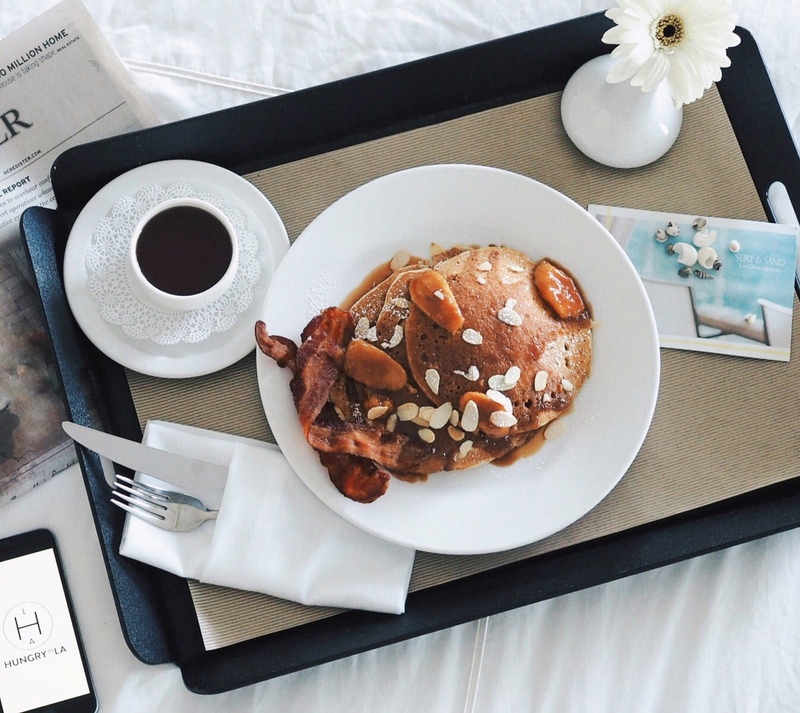 Breakfast in bed: banna meringue pancakes with toasted almonds, banana caramel and whipped cream. 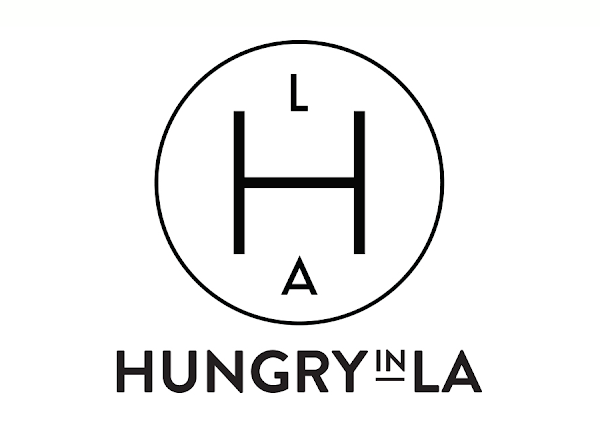 Special thanks to Surf and Sand Resort & Spa for collaborating with Hungry in LA. As always, the content and opinions expressed here are entirely my own.